These tips and pleas were among the guidance that the five New York City borough presidents offered Mayor Bill de Blasio on Tuesday morning. 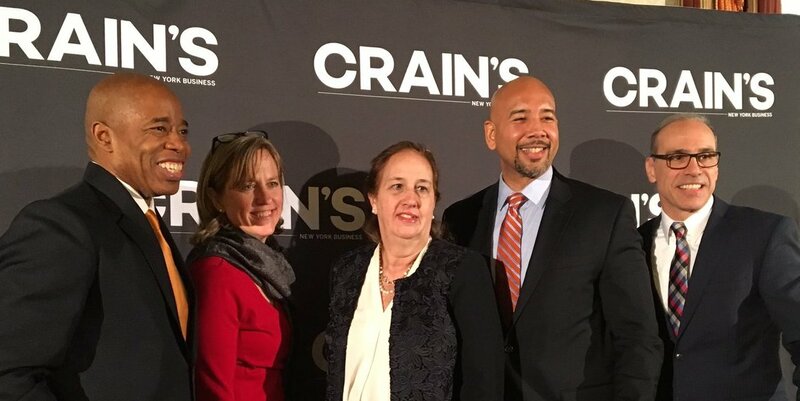 At a forum convened by Crain’s New York Business, moderator Erik Engquist, a Crain’s editor, asked Manhattan’s Gale Brewer, Brooklyn’s Eric Adams, the Bronx’s Ruben Diaz Jr., Staten Island’s James Oddo, and Queens’ Melinda Katz a series of questions, including what advice they would give de Blasio, who has just entered his fourth year in office, which is his re-election year. When Engquist posed the question -- if he asked you for a piece of advice, what would you offer Mayor de Blasio? -- about 20 minutes into the discussion, he got a laugh from the roughly 125 audience members by calling on Diaz Jr. first. The Bronx Borough President has been one of the most outspoken critics of the mayor and is considering whether to challenge de Blasio this year. Once the laughter subsided, Diaz Jr. reiterated a point: that he wants the city to “hand over the keys” to the developers of the Kingsbridge Armory, a project that has been caught in limbo for some time and has been a flashpoint in the tension between Diaz Jr. and de Blasio, with some involvement from Governor Andrew Cuomo, who is much closer to Diaz Jr. than to de Blasio. Of advice for de Blasio, Diaz Jr. then said, “Obviously homelessness is a big issue, not only in my borough, but throughout the city of New York.” He the mayor and his administration “haven’t been able to wrap their hands around” the crisis and called for more permanent affordable housing, supportive housing, and development in the Bronx, saying that the administration takes too long to make decisions. Diaz Jr. also called for improvements to gifted and talented school program offerings and transportation expansion. “He could do a whole lot better, in my opinion, in his messaging and communication to the people of the city of New York,” Diaz Jr. added. Asked by Gotham Gazette after the event to expand on the communication critique, Diaz Jr. said the mayor and his team should be more proactively communicative with local communities about all kinds of issues. It is a common refrain from de Blasio critics -- and some allies -- that was echoed by Queens Borough President Katz and Brooklyn Borough President Eric Adams as well. Among the borough presidents, both Eric Adams and Gale Brewer are strong de Blasio allies. Adams has already endorsed de Blasio for reelection (he plans to run for Mayor himself, he said again at the Crain’s event, but not this year) and Brewer told Gotham Gazette afterward that she is supportive of de Blasio’s bid for a second term. Still, Adams and Brewer had ‘constructive criticism’ for the mayor. Citing “quality of life” issues, Brewer said she wants the mayor to focus on noise mitigation, improving city schools, investing even more in NYCHA and affordable housing, and expanding free WiFi. Brewer credited de Blasio for crime being down and improving relationships between community members and the police, as well as the IDNYC program. 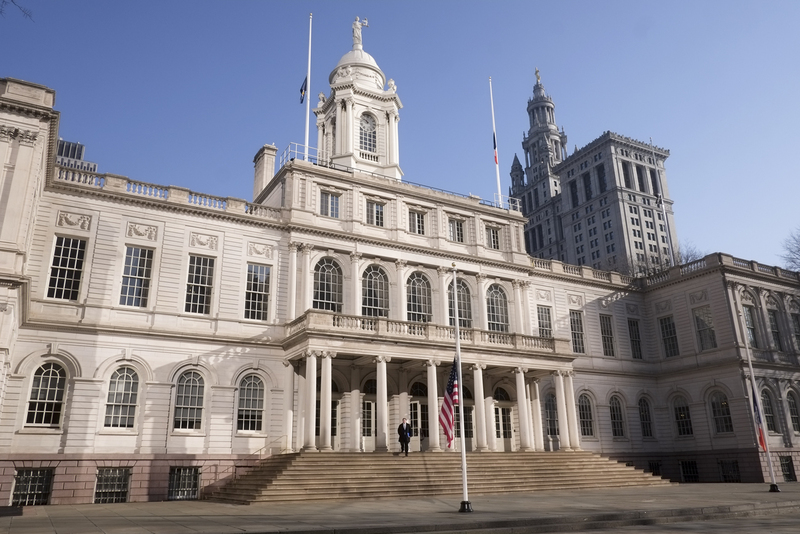 Adams wants the city to stop holding back businesses by continuing to reduce unnecessary fines, an area where de Blasio has made a great deal of progress, and acting more quickly at the Department of Buildings and elsewhere. “The slowest walking human being I’ve seen in my life was at the Department of Buildings,” Adams said, drawing a laugh from the crowd. A former NYPD officer and captain, Adams gave de Blasio significant praise for improvements at the police department, especially in terms of interactions with New Yorkers. “Police are now doing something that is revolutionary,” he said, “they are saying ‘good morning.’” Adams said cops are walking the beat and talking with people, having positive interactions. Speaking after Adams, Queens Borough President Katz said she agreed with several points made by her colleagues before her. She noted that all five borough presidents have known and worked with de Blasio for years, since all six have held other positions in government. “As beneficial as he has been on a lot of topics, the communication part has been ineffective to a certain extent,” Katz said. She credited the mayor for universal pre-kindergarten and general progress. But, she called the “homeless crisis” “a very serious topic,” and cited issues in Queens related to use of hotels for housing homeless people and the protests that Queens residents have staged against the administration on the topic. Katz said she wants the city to better help people stay in their homes and their communities and to enhance “economic services to help get folks back on their feet.” Communities need to be involved in decision-making, she said, at which point Engquist aptly pointed out that communities often reject homeless shelters. Katz responded that “the worst thing you can do with a community is not tell them things” and that there are ways of being more upfront and negotiating better. Speaking last on the topic of advice for the mayor, Staten Island’s Oddo, the lone Republican among the borough presidents, said that a “sea change at the top of city government” with the election of de Blasio has not led to much change at all when it comes to the city bureaucracy that he often does battle with. “You want to have a legacy,” Oddo said to this mayor or any, “you have to change the culture of these agencies, and I don’t believe that’s happening.” Instead of commissioners changing their agencies, Oddo said, he sees agencies changing the commissioners for the worse. A spokesperson for de Blasio declined to comment on the critiques provided by the borough presidents. Other than critiquing the mayor, at the Crain’s event the five borough presidents also discussed specific development projects in their respective boroughs, their takes on Uber and Airbnb, and broader political dynamics. There were half-jokes about the fact that Diaz Jr. is very close with Gov. Cuomo, while Adams enjoys a closer relationship with de Blasio. Yet there were more direct words between Diaz Jr. and Adams over whether Cuomo has been strong enough in backing fellow Democrats, specifically with respect to the state Senate, which remains in Republican control. Brewer said the governor has not been enough of a Democratic champion, which Adams agreed with and Diaz Jr. denied. Adams and Diaz Jr. debated the issue for a couple of minutes. Engquist also asked the borough presidents whether they plan to seek higher office. All five are eligible for another term in their current positions, and the four other than Diaz Jr. are definitively seeking re-election.